If you already have Solar Panels for your home then you will know there are periods of export when you can’t consume all the energy you generate. This energy normally flows back to the grid seamlessly so you may not even be aware of it. If your home has hot water storage, with an immersion heater, then it is ideal for a Solar iBoost+. Fitted in minutes, this gadget will instantly start saving you money on heating. 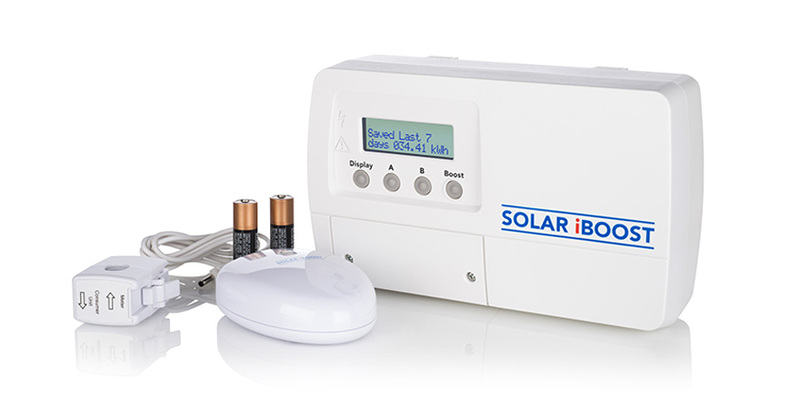 Working wirelessly a Solar iBoost fits neatly into your airing cupboard. The system instantly responds to your home’s variations in power consumption and the changing weather – heating your water when excess power is generated by your solar panels. Quick to install the Solar iBoost works alongside your existing water heating system. No, these will remain exactly as they are. The main difference will be that you are now using all of the energy you are generating – rather than exporting the excess. Using your surplus solar photovoltaic energy to heat the water in your tank means that you do not have to ignite your boiler. This means you use you boiler less and cut the cost of heating water in your home. Essentially, you are using free energy to heat your water rather than paying for it. Contact the team at Life’s Energy for an energy consultation. We will undertake a short, rudimentary survey to check if your home is suitable for the device and fit it at your convenience. Call us now on 01723 371374 or complete the enquiry form on our home page.